Adults with long histories of homelessness and numerous psychiatric hospitalizations, living on the streets of Seattle with untreated schizophrenia, bipolar disorder and other serious mental illnesses and often co-existing chemical dependency. Some have participated in mental health programs in the past, but now are unable to engage with services or seek any kind of care for themselves. Left unengaged, these individuals cycle back and forth from hospital, to jail, to the street. These are the most visible, vulnerable and costly individuals in Seattle. They are frequently exploited on the streets by other people. One-third are defined as high utilizers of jail or hospitals, or referred directly by the criminal justice system to HOST. HOST staff literally take to the streets, reaching out to aide those with mental illness throughout the city streets, and in shelters, hospitals, jails, libraries and other facilities. In partnership with over 40 community entities, including Seattle Police Dept and the Dept of Corrections, HOST delivers critical survival and support services and intensive case management to our city’s most disorganized and ill residents. HOST operates a drop-in center that provides a haven from the streets, and goes to shelters that don’t have mental health services available to homeless clients. This allows trusting relationships to build between clients and staff, which in turn result in increased stability for clients and the community, and which ends homelessness. Staff coordinate a myriad of services in disconnected systems for clients. They establish disability benefits, take people to medical services and predictable food resources, and find them permanent supportive housing. 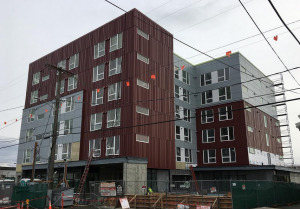 The HOST team integrates their services with DESC’s 300 shelter beds and 800 Housing First apartments throughout Seattle. These programs move people into housing directly from the streets and shelters without conditions of treatment acceptance or compliance. HOST is an interdisciplinary team of 16 mental health, chemical dependency and medical professionals. Together, they interrupt the cycle of homelessness and instability for people and ensure a smooth transition to a mainstream mental health provider. The U.S. Dept of Health and Human Services (SAMHSA) and the Downtown Seattle Association has recognized HOST for their exemplary work. For 11 years, the HOST team has provided annual training to SPD’s Crisis Intervention Team (CIT) in appropriate ways to engage mentally ill individuals in crisis. More than 300 SPD officers have attended this training. In addition, HOST trains Seattle Public Library and Parks Dept staff, homeless shelters and human services organizations, churches and community groups about interacting with mentally ill people.